“Big Brother is Watching You,” stated George Orwell in his chilling classic 1984. That sentence has become synonymous with privacy concerns, government spying and intrusion into our personal data. However, it has also grown to be associated with employee tracking software like Teramind. In this article, I’m looking at the need for less invasive employee tracking and exploring the top Teramind alternatives that employers may want to consider. What is Teramind, and why do we need Teramind alternatives? First, to be clear, there’s nothing wrong with the performance of Teramind’s employee tracking software. The solution provides an intuitive dashboard from which admins can monitor employee activity, assess remote productivity and manage threat levels. Additionally, at $125 per month for up to five users, the pricing is budget friendly, even for small businesses. That said, the depth of monitoring available through Teramind in the wrong hands could be deemed excessive, invasive and downright creepy. I know several remote developers who refer to the software as “Terror Mind”. Take for example the silent mode functionality. This allows companies to filter, track and observe employee behaviour without them knowing it. It allows for pop-up employee warnings, remote locking of employee workstations, keystroke logging and even a stealth to revealed mode. Of course, you could argue that a responsible admin will not abuse the power of Teramind. Indeed, Google’s old code of conduct “Don’t be evil” may well apply in this case. Yet employees are growing increasingly uneasy over excessive and often abused levels of monitoring. Let’s look at the background before we move on to talk about Teramind alternatives. With nearly 50% of American workers now spending at least some time working remotely, a figure that rises each year, we understand why employee tracking software has grown in popularity. In fact, according to new data, nearly 80% of major companies now monitor employees’ use of e-mail, internet or phone. The figure represents a sharp rise from 1997 when only 35% of companies utilised employee tracking software. And there are very good reasons to do so. A company with 1,000 Internet users could lose upwards of $35 million annually from just an hour of daily web surfing by employees. Additionally, 21% – 31% of employees admitted to sending company confidential information to recipients outside the company by email. Why do we need employee monitoring? As a business owner, I fully understand the need to monitor certain activities. Although, my reasons are predominantly centered around the protection of company data and confidentiality as opposed to internet surfing, time wasting or tending to non-work activities during work hours. Help freelancers and independent contractors track and document their hours. Ensure compliance to regional regulatory boards, particularly in the finance sector. Protect confidential data from being transferred by a memory stick, cloud or email sharing. Track the time spent on collaborative projects to generate accurate billing. Record the time spent on non-work activities such as social media and internet browsing to increase performance and productivity. Assess each remote employee’s performance for future pay reviews, promotions or disciplinaries. To apply the same workforce rules across the board to internal and external employees. Monitor the time an employee spends away from their computer. It all sounds straightforward and reasonable. Surely companies checking on employees during their paid working hours can only be a good thing? Perhaps not. I know from experience that excessive or unnecessary monitoring that takes place in already stressful or toxic working environments can potentially negatively impact an employee’s physical and mental well-being. For example, at United Airlines, flight reservationists are permitted 12 minutes for bathroom breaks during a 7.5 hour shift. Anything over that is grounds for a disciplinary warning. Similarly, 9to5 reported on the experience of a telephone service worker who suffered a nervous breakdown which she blamed on “bathroom break harassment”. Is that a correct use of employee monitoring? Absolutely not. Buffer gives team members activity wristbands that track sleep, exercise, nutritional choices and the results are open to the entire company! Being able to see others’ updates is definitely a way to make monitoring less of an unknown. According to the Worklife Report, the wrong type of monitoring can have the potential to adversely influence working conditions. The unintended consequences of invasive monitoring can lead to stress, a faster paced work environment, routinized work activities and lack of control over tasks. In 2018, no modern employer wants that. So how do you easily keep track of progress without adding stress to your employees? Here are the top alternatives for employee monitoring that both employers and employees can support. Pros: ActivTrak produces easy-to-read reports that highlight key behaviour-based data points for each employee. It has an easy interface that allows for application monitoring, remote screenshots, automated alerts, sensitive data redaction and user privacy features. It also offers DLP (Data Leak Protection) and full SQL data access. Cons: ActivTrak doesn’t log keystrokes and therefore may not be ideal for remote data entry employees. Pricing: Free trial. Pricing from $9.00 per month per user. Best For: ActivTrak offers a more holistic approach to employee monitoring. Perfect for tech companies and startups. Why employees prefer it: Used correctly, ActivTrak allows managers to understand the positive and negative working patterns of their employees. It can therefore prompt interesting talking points and productive feedback. Pros: Hubstaff offers app and URL monitoring so you can track the programs and websites that your team members visit — only while the timer is running. You can choose to turn on optional screen capture (randomly captured once, twice or three times per 10 minutes) with the ability to blur screenshots if needed. An activity rate is generated based on mouse and keyboard movement — not keylogging — so you can track productivity levels without intruding on your team. Altogether, these features, which you can customize to your preferences, provide a less intrusive alternative than full screen watching and keystroke capture. Or, you can keep it simple and use Hubstaff for time tracking only. It’s all up to you. All this can be easily compiled into reports should you want them. The software easily integrates with apps like Trello, Mavenlink, Salesforce and Zendesk to name a few. It also works with PayPal, Payoneer, QuickBooks and many more for easy payments and invoicing. Cons: Hubstaff doesn’t spy and report on every aspect of your remote employee’s activities. For example, there’s no keystroke logging. This may be perceived as a con by some who require software like Teramind. Pricing: Free 14-day trial, then starting at $5 per user per month. Why employees prefer it: Hubstaff is popular with freelancers because it easily integrates with the apps they need to get the job done. If employee monitoring is something you’re interested in, it can be easily switched on and set to your preferences. Although for many freelancers (like my writers), it’s not necessary at all. Pros: While not a specific employee monitoring tool, Basecamp is a collaborative project management tool which features chat boards, task management, instant messaging and time tracking. It also provides different access levels, easy integration for mobile and desktop apps plus plenty of file storage. We’ve included it here because it can provide easy check-ins for your team, without the hands-on employee monitoring. Cons: Basecamp itself was not designed for employee monitoring but for project collaboration. However, it does easily connect with software such as Hubstaff, Calamari, TimeDoctor, EverHour and Harvest. Pricing: $99 per month for unlimited users. Best For: If Teramind is on the more intense side of employee monitoring, Basecamp is on the other end. Its fun feel and lack of Big Brother-ness makes it a good fit for those who need minimal employee monitoring. Fast moving industries such as PR and media would enjoy this one. Why employees prefer it: The CEO, CMO, web designer and admin can all be available to chat on Basecamp, which levels the playing field and removes old fashioned hierarchy. It also makes for friendlier remote working. Pros: As the name suggests, if you’re looking for software like Teramind, then StaffCop is probably it. 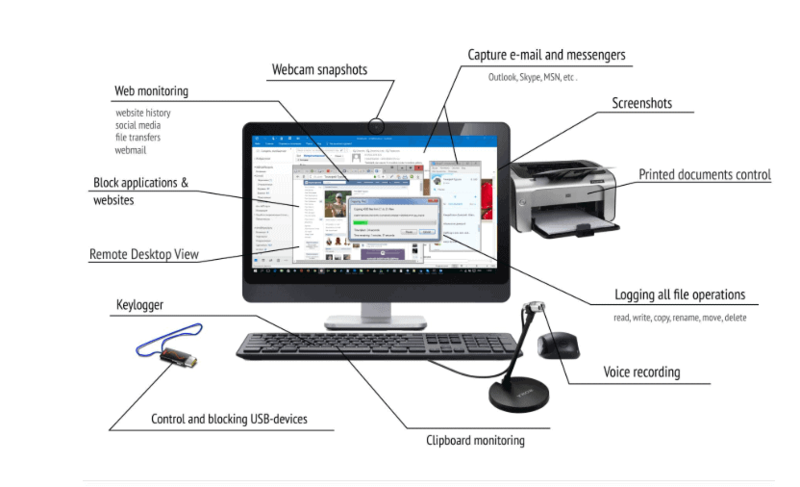 With a full range of monitoring that extends to: audio, video recording, keystroke logging, keyword tracking, remote desktop control, message interceptors, social media monitoring, shadow copying for attached files and monitoring of encrypted network traffic, this software doesn’t mess about. Cons: No cloud-based admin interface, so local installation may prove challenging for large organisations with remote teams. Interface looks a bit dated, as well. Pricing: A range of options from $43 per license. Quantity-based discounts available. Best For: StaffCop would work for companies that have high levels of compliance, data protection and privacy. Namely the finance and legal sectors. Why employees prefer it: They wouldn’t! Pros: Veriato 360 provides a more modern approach to employee monitoring with video playback of screen activity. That makes for ideal “proof” should employers need to use it later. As a Teramind alternative, it stacks up well with customized alerts and reports, file and keyword tracking, anomaly detection, automated behaviour grouping and incident response. Cons: No cloud-based option and a pricey outlay for small businesses or startups. Best For: Veriato is used by a number of high-profile companies to detect and monitor “High Risk” employees. Ideal for large corporate offices, especially those with a high staffing turnover that may be prone to lawsuits. Why employees prefer it: Veriato’s productivity tracking shows managers what times of day prove most productive for employees and the tools they find most effective. This information should allow organisations to be more flexible with remote employees. There are plenty more Teramind alternatives to explore such as Vericlock, Time Doctor, Interguard and Work Examiner. But no messing about, my favourites are Basecamp and Hubstaff. I prefer employee monitoring to be collaborative and friendly as opposed to Big Brother-y and scary so these two hit the mark while also offering easily integrated apps for modern day workers. Heavy duty financial, governmental or legal organisations may need to consider Teramind or Teramind alternatives to comply with their own regulators and protect highly confidential transactions, data and processes. Companies needing to do so should still consider employee happiness, which must factor heavily in monitoring. Avoid excessive monitoring of activities outside of work or while the timer isn’t running (like bathroom breaks), social media and telephone conversations, which can cause undue stress and prove counterproductive in the long run. Does your organisation use employee monitoring? Tweet us and let us know your thoughts.